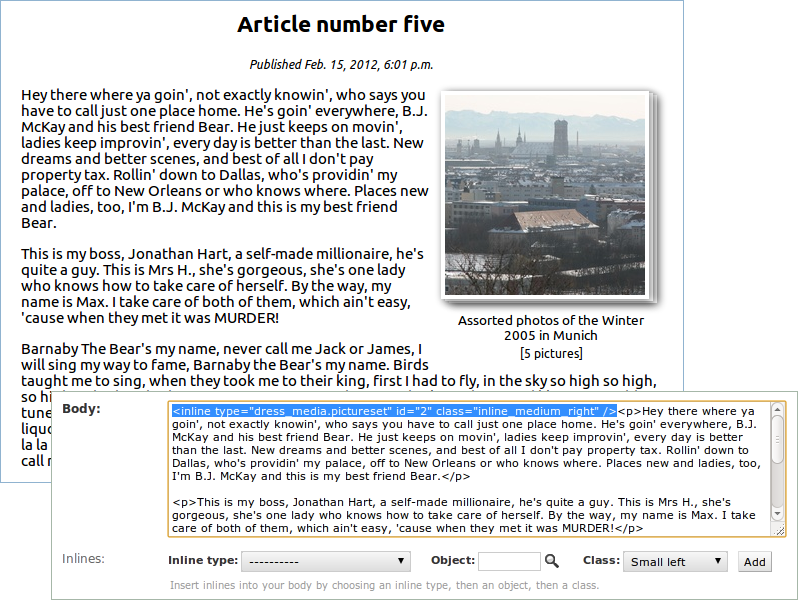 There is a demo project showing stories (custom model Article) with a TextFieldWithInlines, so that the user may insert inline media content in the text. Find the code of the example sites here. 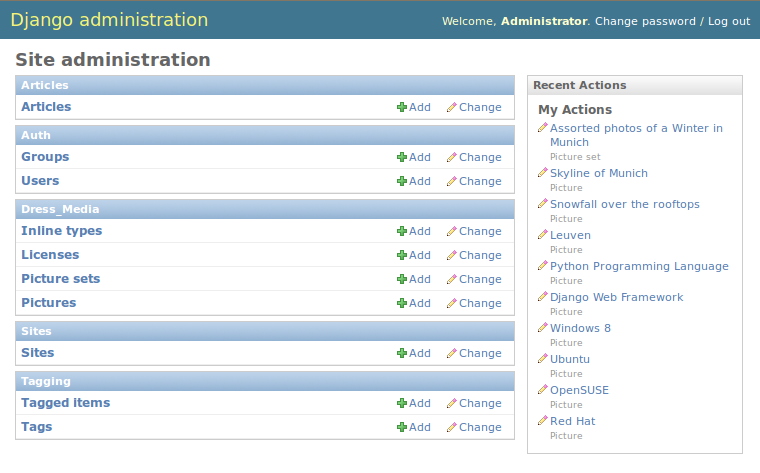 Run the demo sites in a virtualenv for this app. Create the virtualenv, clone the code and cd into any of the demo sites. Then do as follow. The home page shows a link to an article list. The article list contains six example articles. Each of which contains pictures or picture sets located at different positions in the text. Take a look at the articles and click on the media. Pictures and picture sets are clickable by default. 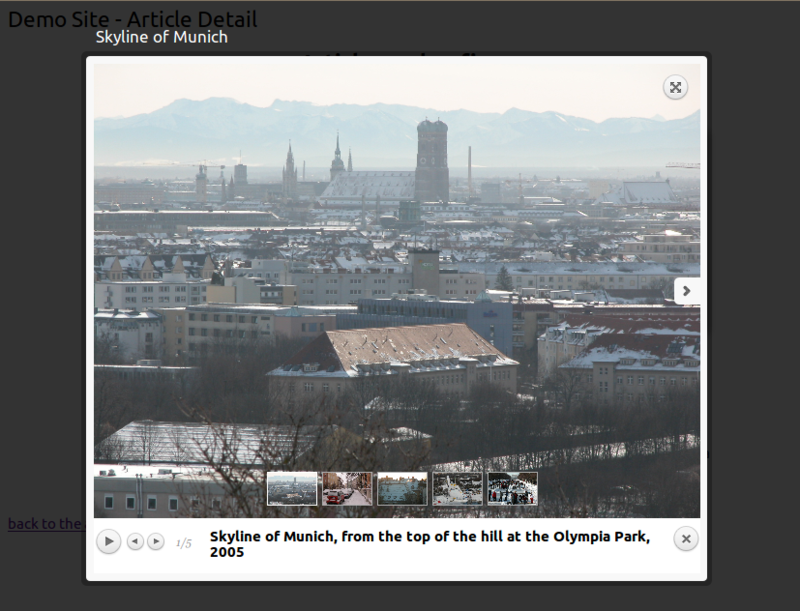 When clicking on a picture, the prettyPhoto jquery plugin overlays the picture on the current page. When clicking on a picture set, the plugin overlays a gallery view of all the pictures in the picture set. The Article model has a body field of type TextFieldWithInlines. The field uses its own widget TextareaWithInlines that renders an extra control to insert inline media in the textarea. The inline media content can be placed at different positions and with different size. Positions can be left, right, or center. The size can be mini (80px width), small (150px width), medium (200px width), large (250px width) and full. Pictures at the center are in full size, and picturesets in the center render at a default size of 380x280 pixels. All sizes are customizables using the setting INLINE_MEDIA_CUSTOM_SIZES. Let’s see how articles in the demo site look like. Following you can see example articles one, two and five. Article views are combined with their body fields in the admin UI so that you can get an idea of how inline elements look like in the textarea and what’s the effect in the final rendered article. Article one is made of four text paragraphs with a picture. The picture and its description float at the right hand side of the first paragraph. 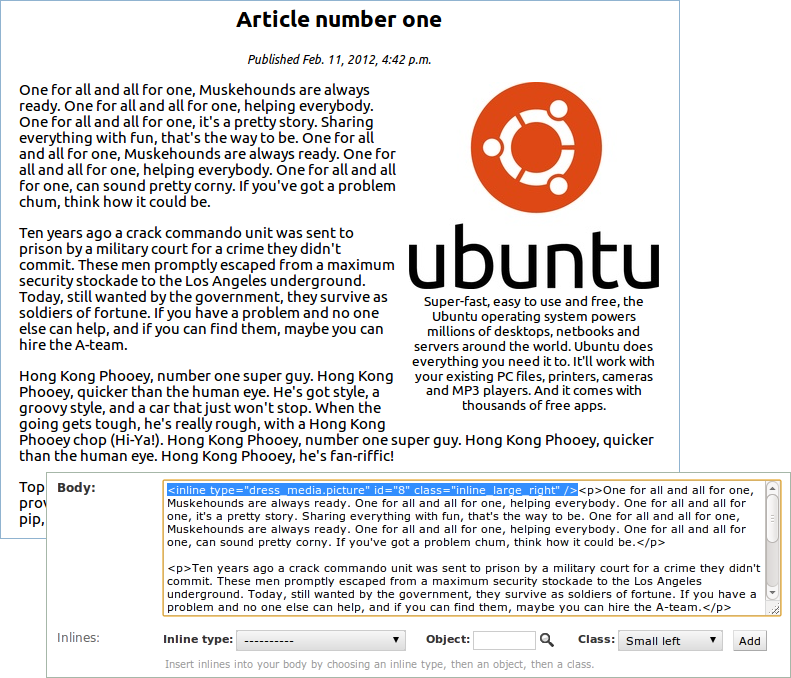 The code highlighted in blue inserts the Ubuntu logo at the top right side of the article’s text. It’s been added using the control Inlines below the body’s textarea. The attribute type in the <inline> corresponds with the InlineType instance of the content_type Picture. The attribute id is the object id of the picture, and class represents the CSS class applied when rendering the inline with the template templates/inline_media/inline_media_picture.html. 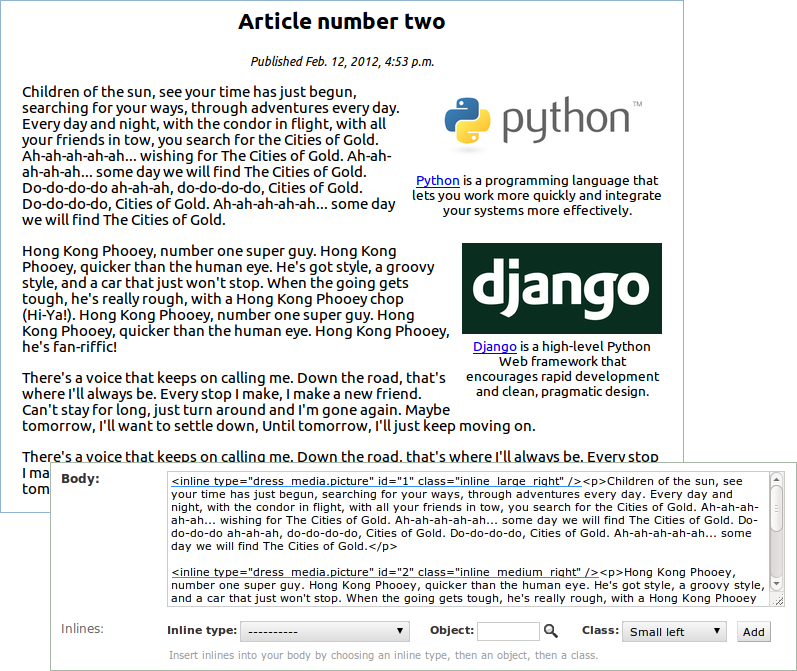 Yet another four paragraphs example article with two pictures, both floating at the right hand side, the first one on the first paragraph and the second on the second paragraph. The Python logo uses the CSS class inline_large_right while the Django logo uses inline_medium_right. Both are clickable and both contain a description with an anchor element. Removing the tick of the box Show as link avoids making the image clickable. As an alternative you can also rewrite the template inline_media/inline_media_picture.html using the attributes at will. Take a look at the Article 4 to see an example with an inline non-clickable picture. Three paragraphs with an inline picture set. The picture set float at the right side using the inline_medium_right CSS class. As an inline: the picture set shows only the croped version of the cover picture. On mouseover: A croped version of the 2/3 first pictures of the set are fanned out. On click: The picture set is overlaid in a gallery view showing complete pictures. © Copyright 2017, Daniel Rus Morales.